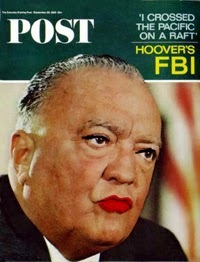 FBI J. Edgar Hoover doctored [found here] with post on blog. Eddie Conway interviews Ward Churchill Real News Network youtube video referred to is [found here]. Those who were politically objectionable, communists, socialists, homosexuals, influential in the media or news, were for integration and US Constitutional Rights were targets of FBI COINTELPRO. Pre-9/11 and post, those who are Crime Watches, want to reduce property taxes, or have issues with predatory policing, court and lawyer profiteering, public corruption, or the operation of international banks and corporations can be blacklisted. Pre-9/11 priests and religious leaders were offered a carrot and/or a stick to turn in members of their flocks who are self-employed, gun owners, outspoken, or have issues with a corrupt establishment, predatory police, or who advocate paying less property and other taxes. Priests were threatened and bribed to be police informants. Injustice Busters page [found here]. Post about elitist judge covering up for predatory policing, judicial misconduct and profiteering, and public corruption [found here]. Supreme Court Justice Chase T. Rogers should be prosecuted, not renominated this coming Friday at the legislative hearing held by the State of Connecticut Judiciary Committee.